“Within Sight” by Eva Lundsager. PORTLAND, Maine — What constitutes a painting these days may not include paint, but certain A-B-Cs of the medium still guide our thinking: landscape, portraiture, and still life. 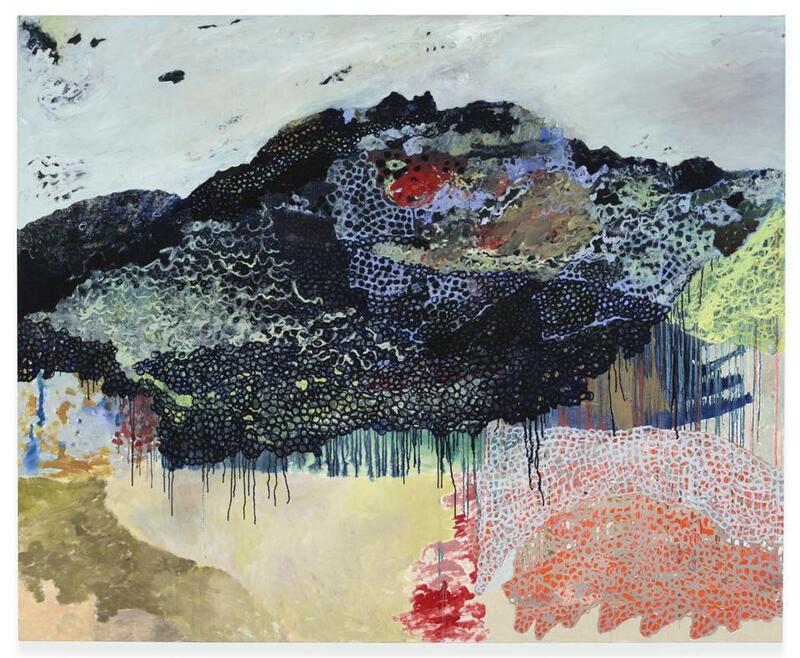 These three categories are the dress form upon which curator Michelle Grabner drapes “American Genre: Contemporary Painting,” a scintillating, clamorous show at the Institute of Contemporary Art at Maine College of Art. The artists in “American Genre” often joust with the rules. José Lerma’s brilliant “Carlos IV de Borbón” a portrait of the ne’er-do-well Spanish king, is made of pigmented silicone in flat, bulbous shapes attached to the canvas like Colorforms, but gently ridged to mimic brushstrokes. It’s a cocktail of historic aristocratic portraiture and puckish Cubism. Angelina Gualdoni, meanwhile, sets a careful interior in the foreground of “Klatsch,” but through a window we witness a vaporous color-field explosion — a landscape either dazzlingly dappled or apocalyptic. The flowers in Griff Williams’s zingy still life, “Assertion No. 3,” are languid, just past peak. A tremulous vase in straying stripes looks held in place by the glossy black ground. Over the surface, a blunt, flat, dot-matrix pattern of a blossom flashes. Williams Ping-Pongs between picture and pattern, surface and depth, analogue and digital. “American Genre” features 52 paintings by as many painters, from precision realism to exuberant expressionism. They all glory in material — and the plasticity of a medium that seems made to set limits, and then defy them. gmail.com. Follow her on Twitter @cmcq.